Photos Coming Soon A surface and upper level low combined with a cold front set off severe weather across Arkansas. The first strong cell developed across Clark County. At 7:01am, it entered Garland County and turned severe. Strong cells began to develop north of the storm. Around 7:20am, a severe thunderstorm warning was issued for Saline County, as a storm moved west of Benton. I was located in West Little Rock in Pulaski County. At 7:35am, a severe thunderstorm warning was brodcasted over NOAA Weather Radio in my chasemobile. Pulaski County was under the warning and I decided to verify hail size. Reaching the core, the hail came down at an incredible rate. As I countinued to drive, the hail started as dime size, then quarter size hail flew down. The hail had also covered the ground and roads. The only damage I received was a little chipped paint. Aa squall line developed in West-Central Arkansas at 2am with a few storms reaching severe limits. I went out to shoot some stills, but the line fell apart rapidly as it encountered a more stable atmosphere. 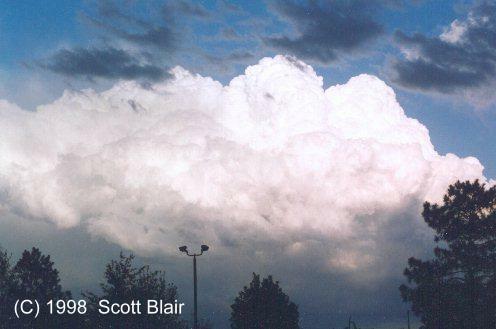 Much later that day, an upper level low produced low-topped severe storms. At 6:00pm, twilight gave me just enough light to take stills of the approaching storms. At 8:35pm, another severe storm moved north of LIT. I took more stills of the backside of the storm while stars filled the sky above. A funnel cloud was later reported near Jacksonville. Photos Coming Soon Storms developed rapidly at 7:00am across SW AR. Severe storms broke out in Clark and Hot Spring Counties. I went south on I-430, then east on I-30 and took an exit quickly off to S LIT. I observed cg lightning at 8:35am. After this storm, I focused my hopes of storms in Eastern AR. I took I-40 east and stopped in Brinkley. Still in rain, I decided to move to SE AR with the highest instability. I observed a minimal severe storm just north of Dumas, AR. At 3:00pm, the chase day was over and headed back to LIT ending the 350 chase. Photos Coming Soon I departed LIT at 1:45pm and drove west on I-40. At 2:00pm, a tornado watch was issued for Central, West, and North AR. Traffic was at a dead stop for miles near Mayflower. In 30 minutes time, I moved a whopping half mile. I finally found an exit and decided to take Hwy167 up to NE AR to intercept severe storms already in progress across NC AR. I continued on Hwy167 and arrived near Newport at 5:00pm and placed myself at a good open location. At 6:00pm, I was concerned that my location was not sufficient. I decided to go south for about a few miles. This little travel south eluded me to the first promising sign of the day, a gust front. I continued to travel south until a vivid bolt of cg hit near the gust front. I quickly pulled off onto the side of the road and jumped out with my camera and began to film. However, I forgot to hit the record button! I quickly discovered my mistake and jumped back in the car as lightning was getting close. At 6:10pm, the strong winds from the squall line had finally met my car. Winds around 55mph whipped sheets of rain and the car. At 6:15pm, the line had passed and sunset arrived. On the way back to LIT, I was treated to convective cloud tops that were soaked in yellow and orange. George Hoelzeman and I setup in Western AR as a cold front entered the area. Storms reached our target east of Lamar near an open lake for visibility around 7:45pm. We observed several weak rounds of storms, until 10:30pm when I developing supercell prompted a tornado warning for Logan County just to our west. Lightning activity rapidly increased as the cell pushed closer to our region. We decided to bump east on I-40 out of the path. After driving a few miles to the east, we decided to exit the interstate. At that moment, a bungee cord stuck in the sidewall of my tire! How? I don't know. We quickly changed the tire and decided to end the night chase. After morning convection, it wasn't clear if redevelopment would take place. However, skies cleared and enough instability and lift was present for a supercell to initiate by 4:35pm. The storm developed just east of LIT and virtually followed I-40 across the entire state. A tornado watch was issued for E AR by 5pm. The storm had nice structure as I continued to close in. In Lonoke, wind damage and hail on the ground was noted. I pulled off in Brinkley and shot a few more structure stills. At Shell Lake in extreme E AR, I shot some cc/cg lightning and a rainbow and returned to LIT. Photos Coming Soon A long day of storms. First intercept started with an early morning supercell. I set up in LIT at 1:45am for a severe warned cell. I captured some decent lightning and severe winds. I followed the cell across the AR River on I-430. At the peak of the bridge, I experienced intense winds over 60mph that made driving hazardous. Shortly after, I returned back to LIT. I later discovered the cell was actually tornadic and a confirmed tornado had lifted 3 miles from my location. The evening brought more storms to AR. We followed some rapidly developing towers near Bald Knob, AR around 6pm. These turned severe but rapidly moved away. We then focused attention to new storms that we intercepted near Wynne. 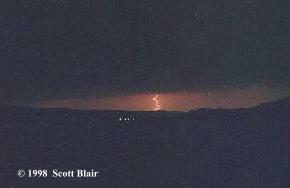 An excellent lightning show was observed near Wynne along Hwy1. Intercepted a severe storm just outside of RUE. 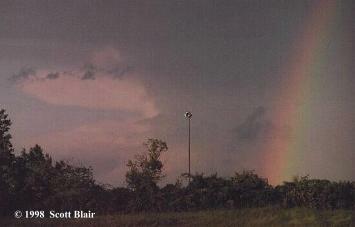 Once the cell passed, George Hoelzeman and I observed an excellent double rainbow. A cell to the south produced a nice anvil and mammatus. We decided to follow the cell eastward along I-40 watching an active lightning show. 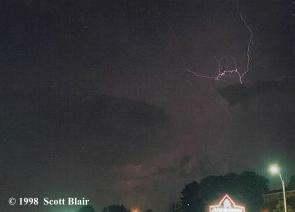 We decided to shoot some stills of the lightning so we pulled off ontop of a hill in Conway, AR at 9:30pm. After thirty minutes of shooting stills, we decided to bump eastward. A new severe storm developed just to the west in Perry County. We quickly stopped in Maumelle, AR which was in the path of the storm. Around 11:30pm, a severe t-storm warning was issued for Pulaski County placing the storm directly in our location. We took some stills of the approaching shelf cloud and observed decent winds. We followed the cell to Jacksonville and ended the day. A dynamic system entered AR just after dark. A strong cap was in place across the south half of the state. 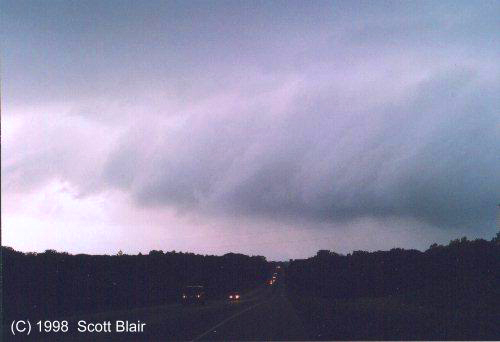 Around 11pm, a supercell developed west of LIT and was placed under a tornado warning. 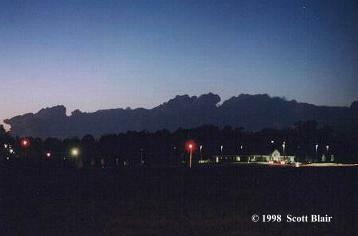 I departed LIT shortly after to the blasting of tornado sirens filling the night sky. The cell continued to move east into the northern sections of LIT. 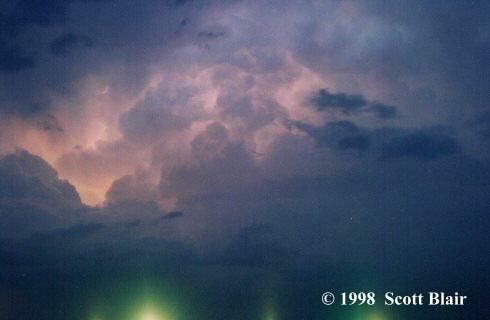 The supercell was low-topped and therefore the lightning production critical for a successful night chase didn't exist. I lost the cell east of LIT. A new cell developed to the west and the lightning production was significantly improved. Numerous cc bolts leaped from the storm top and I took plenty of stills. I ended the day as the storm plowed over around 1am. Overall a poor chase day even with ample instability and wind dynamics across Arkansas. SPC issued moderate and high risks across the state throughout the day. I chased the first severe storm near London, AR west of RUE around 2pm. The storm visually was poor in structure and I failed to observe anything interesting besides pea-sized hail. I blasted back east ahead of the developing storms and stopped in Pine Bluff, AR. 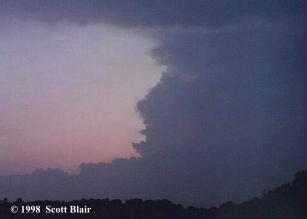 I observed a dying previously warned tornadic supercell toward sunset. FULL ACCOUNT AVAILABLE.George Hoelzeman and I targeted areas of Eastern OK. We departed LIT around 12pm and arrived in Sallisaw, OK at 4pm. The cap finally broke by 5:30pm as towers exploded to the west. The first significant cell developed just west of Sallisaw and moved directly over our location. We were slammed with close lightning and very heavy rain. We followed in behind the storm eastward on I-40. Around 6:30pm, we observed a wall cloud east of FSM. The feature became outflow dominated within a short period of time. At 7:06pm in Hunt, AR, we observed 1" hail and strong winds. We broke ahead of the supercell and observed the cell east of Clarksville and again at Russellville. The cell finally lost some strength near RUE and outflow winds rushed out. I returned to LIT for round two as a dangerous squall line was blasting west. Around 12am, I observed the line as it knocked out power and prompted the city to sound tornado sirens. After this excitement, I ended the day. 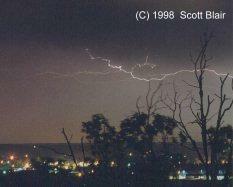 George Hoelzeman and I left LIT on the 6th for a dryline setup in West TX expected on the 7th. Low clouds limited surface heating and visibility. Additionally, a strong cap made matters more difficult to pinpoint a target. We targeted W of LBB and waited for several hours. A supercell finally developed along the dryline NW of our location near the Clovis, NM region. We intercepted the tornado-warned cell west of Dimmitt, TX near Flagg. A nice lowering along with a RFD punch was observed. A quick dust-whirl tornado was observed 3 miles north of Flagg, TX before the RFD blasted through the area of rotation. Shortly after we observed 2.5" hail. We let the storm pass by and sunset followed. The low clouds cleared behind the supercell and we shot stills of the active lightning show associated with the storm top. We ended the day in AMA. FULL ACCOUNT AVAILABLE.We targeted SW OK in approach of a dryline, but soon discovered the dryline was blasting eastward. George Hoelzeman and I bumped towards OUN and observed a decent supercell. A stronger supercell developed near Amber, OK and we dropped south to intercept. The forward flank was quite impressive and quickly overtook our location sending copious 2" hail over the chase car. Finally escaping the hail, we blasted east and observed tornado damage near Wewoka. We were able to gather a quick low-contrast glimpse of the Wewoka Tornado and continued east on Hwy270. After capping a few more hills, we observed the Yeager Tornado as it began to rope out. We followed the supercell for several more hours and observed another supercell from a distance at sunset over OUN. The lightning show was excellent on the way to FSM.